It’s not that conflict in Syria could spill over across the borders with neighbors. In truth, it is the Syrian regime of President Bashar al-Assad’s regime that is desperately trying to spread chaos in the region. After providing a safe haven in northern Syria for the PKK (Kurdistan Workers’ Party) to destabilize Turkey in cahoots with Baghdad and Tehran, Damascus switched to Beirut. But its first go boomeranged this week when it was caught red-handed trying to spread the fires of civil strife to Lebanon. The Lebanese judiciary yesterday took the unprecedented step of indicting Assad’s topmost security chief -- Gen. Ali Mamlouk -- and one of his military aides, named only as “Col. 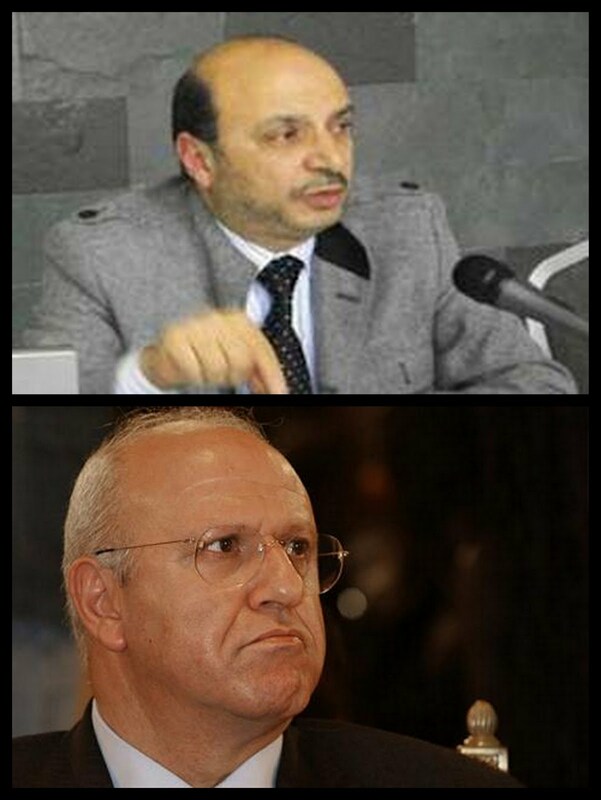 Adnan,” along with a former Lebanese government minister and Assad’s Number One man in Lebanon, Michel Samaha. Military Tribunal Judge Riad Gheda yesterday issued an arrest warrant for Samaha after Judge Sami Sader indicted all three for planning to organize a group to commit crimes against public figures and undermine Lebanese state authority. The group would trigger sectarian strife by way of terrorist operations, making use of explosive devices primed by Mamlouk and Adnan and delivered by Samaha. The group’s targets would have been religious and political figures attending a series of iftars, the evening meal that breaks the daily fast during Ramadan, which would have brought together Sunni notables in north Lebanon, an area of strong support for the Syrian opposition. The attacks could have also coincided with a five-day visit by Maronite Patriarch Beshara Ra’i to the north Lebanon district of Akkar later this week. The main objective might have been to create Sunni-Alawite and Sunni-Christian sectarian strife. Samaha confessed to the plot when faced with compelling evidence on the day of his arrest. Officers from the information branch of Lebanon’s Internal Security Forces (ISF) raided Samara’s home in the village of Khenshara north of Beirut early Thursday, bundling him into a car and seizing documents, CDs and computers. The most damning piece of evidence against Samaha is video footage shot in secret by M. Kfouri, a man who became an informant for the ISF after Samaha allegedly attempted to recruit him for the plot. Kfouri told the ISF that Samaha had asked him to secure a group of trusted young men to transport explosive devices to the north and set them off there in exchange for a sum of money. The ISF reportedly provided Kfouri with a spy pen camera to record his contacts with Samaha. Video footage subsequently shot in secret by Kfouri shows Samaha discussing the plot and meeting in a garage under his Beirut office. There, he handed the explosives and $170,000 to Kfouri. Samaha was filmed personally carrying from his car trunk the explosives, which were 24 in number, including four weighing 15 kilograms apiece and the rest weighing about 1.5 kilograms each. The agent later drove to the ISF and handed them the explosives. Quoting unnamed security sources, Lebanese media quoted Samaha telling interrogators after his arrest, “This is what Bashar wants,” a reference to the Syrian president. He also reportedly confessed to have driven to Damascus earlier this month, where he called on Gen. Mamlouk, who asked him to take the explosives to Beirut. Mamlouk told Samaha to hand over his car keys to “Col. Adnan” to secure the explosives in the boot. Samaha did just that before driving back with the bomb load in his Audi A8 to Beirut. A Sunni from Damascus, Gen. Mamlouk, 66, heads the Baath Party Regional Command’s National Security Bureau (NSB), which in theory co-ordinates the work of Syria's intelligence agencies and formulates recommendations for the president. Between 2005 and 2012, he was head of the General Security Directorate (State Security), where he was involved in some of the most sensitive issues concerning Syria. Before that he was deputy head of the feared Air Force Intelligence. In April 2011, the U.S. government imposed sanctions on Gen. Mamlouk, saying he had been responsible for human rights abuses against civilians. The U.S. also said he had overseen a communications program directed at opposition groups and had received both technological and analytical support from Iran’s Ministry of Intelligence and Security (MOIS). Mamlouk had “worked with the MOIS to provide both technology and training to Syria, to include internet monitoring technology” and “requested MOIS training and assistance on social media monitoring and other cyber tools for the GSD,” it added. Assad asked Gen. Mamlouk to lead the National Security Bureau after its director, Gen Hisham Ikhtiar, died in last month’s bomb attack on its headquarters. Samaha, for his part, was born in 1948 and received his first Phalangist Party membership card in 1964. Former president Amin Gemayel appointed him as his media advisor, which led him to chair Tele-Liban, Lebanon’s official television station. Following frequent visits to Damascus in the Eighties and Nineties, Beirut’s pro-Syrian daily al-Akhbar reports, he started playing two roles – one as a Lebanese political operator and the other as Syrian-French intelligence operative. His influence in France started to grow as his friends in the French administration became more powerful. One of them, Claude Guéant, became chief of staff to Nicolas Sarkozy and his point man on Syria. In July 2008, when a small Lebanese delegation headed by President Michel Suleiman paid a visit to Assad at his hotel during a state visit to Paris, its members were surprised to see Samaha, a Lebanese, included in the Syrian delegation. The incident underlined Samaha’s influence with Damascus and, therefore, the significance of his arrest and indictment. Samaha would spend time in the Damascus Sheraton lobby receiving visitors – be they Syrians, Lebanese or foreign journalists. Even after the outbreak of the Syria crisis, Samaha was the only serious conduit of the regime’s tales to foreign media about insurgents and the Islamist character of the uprising. Editorially, Ahmad Ayyash, writing today for Beirut’s independent daily an-Nahar, decries Assad’s “insolence” for having the guile to personally contact Lebanese officials and demand Samaha’s release. Ali Hamadeh, in his daily column for an-Nahar, says the Lebanese judiciary should not suffice with Gen. Mamlouk’s indictment – “he too should be served an arrest warrant. “Moreover, all Syrian regime officials and their family members should be denied entry to Lebanon. For example, the spouse of Maher al-Assad recently spent almost a week in Beirut calling on boutiques, beauty salons and plastic surgeries while her husband and the Assad clique were planning to kill more Lebanese” than they have over the years.